Background: Dipeptidyl peptidase-4 (DPP4), a serine exopeptidase which is found in human, is encoded by the DPP4 gene. Glucagon-like peptide-1 (GLP-1) and gastric inhibitory polypeptide (GIP) levels increase in the presence of DPP-4 inhibitors, which also inhibit the release of glucagon. Accordingly, insulin secretion increases with gastric emptying and blood glucose levels decrease. Objective: The aim of the present work was to screen suitable DPP4 inhibitors which can be used to treat diabetes mellitus type 2. Method: 230 sulfonyl-benzamides have been screened by Discovery Studio Molecular Docking Programme to search the best suitable molecule for type 2 diabetes treatment. To find inhibitors with high stability and flexibility, molecular dynamics (MD) simulation has been done and Lipinski’s rule of five protocols has been employed to screen druglikeness. ADMET (absorption, distribution, metabolism, excretion and toxicity) filtration has also been used to value the toxicity. Among them, 106 sulfonyl-benzamide showed better docking score than the approved diabetes mellitus type 2 drug. These sulfonylbenzamides also passed the ADMET and druglikeness filters. Quantitative structure– activity relationship has been studied to observe change in the docking properties with the change of druglike sulfonyl-benzamide molecules. DFT computation of optimized geometry and derivation of molecular orbitals have been used to correlate the druglikeness. The small difference in the energy between HOMO and LUMO may help to activate the drug in the protein environment quickly. Pharmacophore generation has been done to recognize the inhibitors binding modes in the active site of receptor. Results: 4-chloro-N-[3-[[(1S)-1-(4-methylsulfonylphenyl)ethyl]amino]-3-oxopropyl]benzamide (MSPB) showed the best theoretical efficiency as DPP-4 inhibitor. Conclusion: Structure based drug design approach for the treatment of type-2 diabetes revealed its influence on the development of new DPP-4 sulfonyl-benzamide inhibitors. 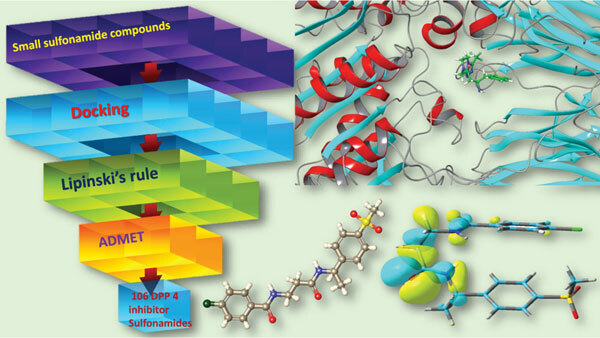 Sulfonyl-benzamide, type-2 diabetes DPP-4 inhibitors, structure based drug design, molecular docking and MD simulation, ADMET, pharmacophore generation.